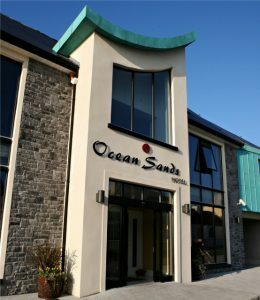 People in Enniscrone were “shocked and saddened” by the fire at the local Ocean Sands Hotel in the early hours of Saturday morning. DAMAGE: The Ocean Sands Hotel in Enniscrone. Councillor Joe Queenan said that it was a blow to Enniscrone. “It couldn’t have happened at a worse time, the peak weekend of the year, the August bank holiday. “When people woke up on Saturday and realised a fire had damaged the Ocean Sands they were really saddened and shocked. “However, the management and staff have rallied tremendously and even though damage is extensive they are hoping to be open again in a couple of weeks”, he told Ocean Fm. Sligo fire service said that three units of the fire service attended at the scene of the fire – Sligo, Ballina and Enniscrone. “The alert was received at 3.22am and the Fire Service were in attendance at 3.29am. “The fire appears to have started in the kitchen area and was quickly brought under control. Fire service personnel left the scene at 10am”, a spokesperson said. There were 128 guests and some staff in the hotel at the time but all were safely evacuated. They were accommodated in surrounding hotels and Bed and breakfasts. Extensive damage was caused to the hotel kitchen and smoke damage was caused to other parts of the building, including some bedrooms. A wedding reception which was due to take place in the hotel on Saturday had to be moved to another hotel in Ballina and alternative arrangements will also have to be put in place for weddings scheduled over the next couple of weeks. The 50-bedroom, family run hotel was built around 10 years ago.